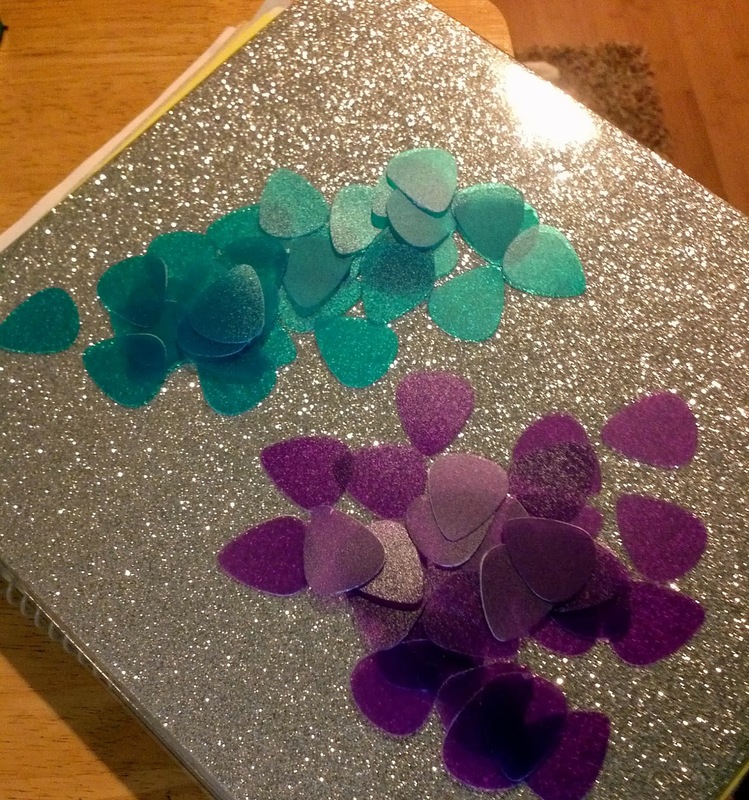 Introduction: I discovered about this thing called a "Pick Punch" which is basically a large guitar pick shaped hole punch. I bought one online through eBay and couldn't wait to get it. Once I got it, I torn it open and began punching into glittery card stock and various different materials. Pretty quickly I found what worked and what didn't work. Some materials were too strong to be cut by the punch. I noticed that they sold nylon sheets online for these punches, but I thought I would be able to find one in a store. First I went to Home Depot, Michael's and a few other craft stores and they didn't have anything close. This I wasn't expecting, but it didn't take long until I found great materials. In the 'Back to school' section of my local dollar store were index card holders. I wanted to give them a try. They came in a bunch of different colors and they were the perfect thickness. Similarly-made folders and binders also work well. Part of the trick is finding material that isn't too thin or too thick. Since a big part of what I do is turn trash into treasure, my guitar picks are made out of materials like cigarette boxes. First I remove the outer plastic wrap from the box and cut them apart. Then I cut them with my Pick Punch. I glue the two sides together having it dry under wax paper and a heavy book (that weighs it down for pressure). Once it's dry I trim & file the edges and paint it. Lately I've been way into glitter so mine have been painted with various colors of glitter. Next I start processing them by casting them in layers of Mod Podge and sealing them with epoxy resin. Let them cure completely. 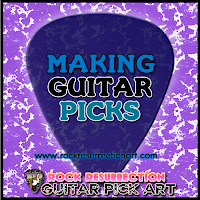 You can also make simple plastic guitar picks by cutting up and punching guitar pick shapes out of plastic materials. Make sure to file the edges with sandpaper or a nail file to touch it up. 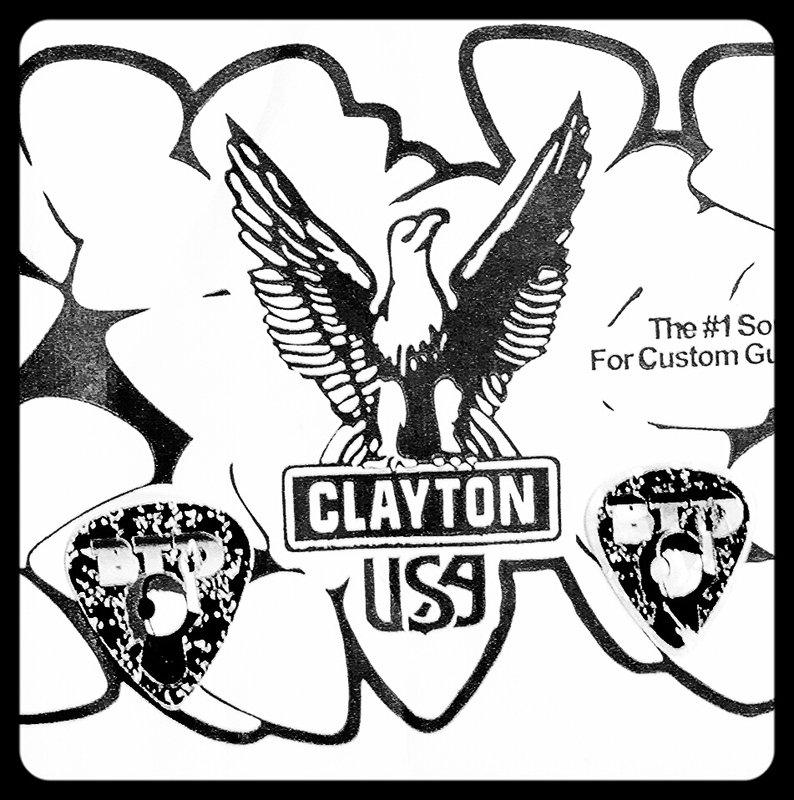 The next phase: making guitar picks with my on design on them. Since I can't do that on my own (with an HP printer and a Pick Punch). 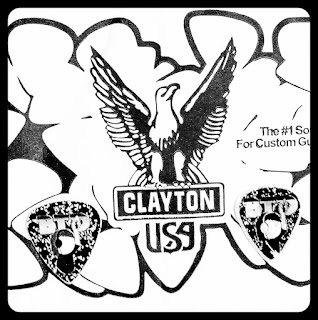 I asked around within my music network to find out where folks got custom guitar picks made. Well, all signs pointed to Clayton Custom. And I ordered a batch through them. My first batch was done in full color, my second in black and white on a pearl pick. Got a whole workshop set up at Rock and Roll Headquarters making guitar picks and jewelry and I'm having a blast doing it.